SANCTIONED BY: Potomac Valley LMSC for USMS Inc.
**Online registration is now closed. Please contact social@swimdcac.org if you all still interested in entering the meet. Entries will be accepted based on lane availability. WARM UPS & MEET START: Warm ups will take place between 9:00-9:50am. The meet will then start at 10:00am. ENTRIES: Online entries close at 11:59 PM on Friday September 29. Paid by credit card to "ClubAssistant.com Events". NO REFUNDS of entry fees. Competitors may enter up to 5 individual events for a $25 flat entry fee. The 500 Free is limited to the first 32 entrants.The meet is open to all Masters Swimmers holding a valid 2017 USMS registration card. Age is determined by a swimmer’s age on October 7, 2017. 2017 USMS rules and regulations apply. RELAYS: Relays are at no cost and must be entered by the close of warm up. COURSE and SEEDING: Events will be seeded slowest to fastest, men and women combined. The pool will be configured to 8 lanes of 25 yards (SCY). Additional warm up/warm down lanes will be available. The length of the competition course without a bulkhead is in compliance and on file with USMS in accordance with articles 105.1.7 and 106.2.1. HOSTED HOUSING: If you are traveling from out of town and are interested in hosted housing, click here. T-SHIRTS: We are selling short-sleeve T-shirts for $20 when purchased via online registration. A limited number of shirts may be available at the door for an additional cost. The T-shirt is a Greenwich T-Shirt by Canvas and one of their softest 100% cotton tees. This is a great choice for anybody looking for a lightweight, slightly fitted shirt. It's a unisex product, so it makes great custom shirts for men or women! DIRECTIONS: From the Beltway: Take Md-185/Connecticut Ave exit South (towards Washington). At the traffic circle, continue straight on Connecticut Ave. into DC. Turn right onto Nebraska Ave NW. Turn right onto Albemarle St. Take 1st Right onto Fort Dr. NW. Parking is available on surrounding streets. 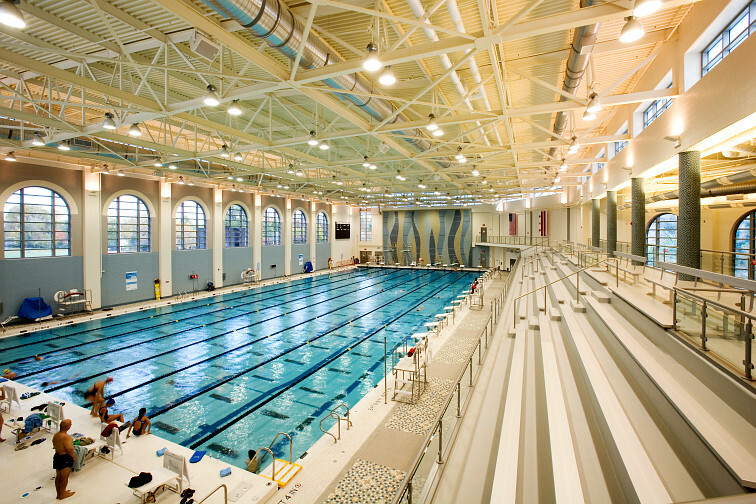 Public Transportation: The Aquatic Center is one block from the Tenleytown-AU Metro Station on the Red Line. See http://wmata.com for more information. Friday, October 6th: Welcome Happy Hour, Town Patio 7-9pm. Find more info on Facebook. Saturday, October 7th, Post-Meet Party. Join your fellow competitors for a drink or two post-competition from 5-8pm at 1601 5th Street, NW, Unit C, Washington DC 20001. Find more info on Facebook. Online Registration closed on 9/30/2017.